Boston, Mass., July 2, 2007 – Ryan McCourt, a manager at McCourt Construction Company has been elected Secretary of the Board of Directors of Construction Industries of Massachusetts (CIM). CIM is a trade association representing the transportation and public works construction industry in Massachusetts. Ryan was first elected to the Board in 2006. He will serve as an officer of the Board for a term of one year. 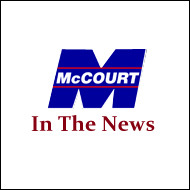 This will be the sixth consecutive year that an executive from McCourt Construction has served on the Board. Founded in 1921, Construction Industries of Massachusetts is an association that represents all aspects of the transportation and public works construction industry in Massachusetts. Members are general contractors, subcontractors, material suppliers, equipment dealers, engineers, consultants, insurance and bonding companies, law and accounting firms and other companies interested in furthering the progress of the industry. McCourt Construction is a comprehensive general contractor that was founded in 1893. The company has worked extensively in both the public and private sectors, developing an expertise in infrastructure projects, real estate development, site work, landscaping, utilities, and finish work. Based in Boston, Massachusetts, McCourt has taken on projects from California to London, from Canada to the Caribbean.